This Rifter® is all about pushing the envelope, trying new things and alternative methods, rules and approaches to create epic adventure! Role-playing games (and The Rifter®) are all about expressions of your imagination. Of making ideas, characters and stories come to life. RPGs are flexible. Malleable. Alive and changing. There is no one way to look at things. Open your mind to the infinite possibilities. 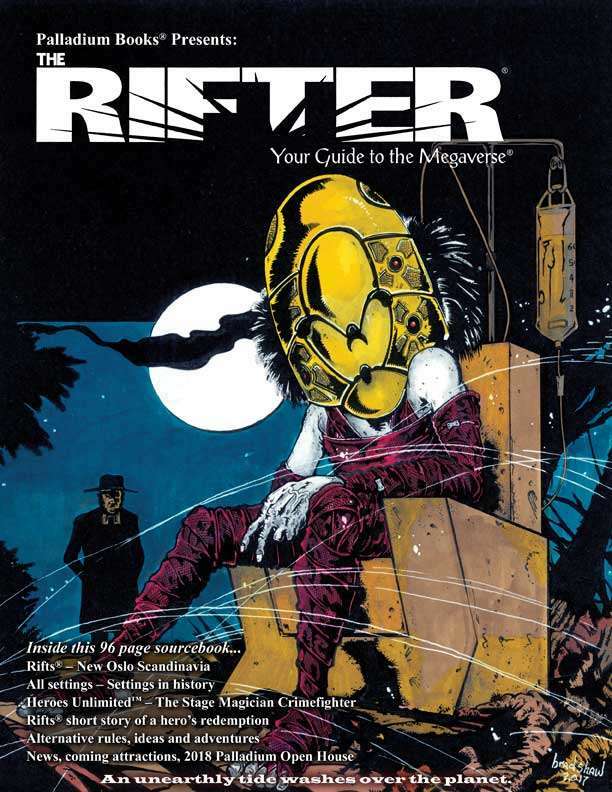 This issue of The Rifter® explores some of those new possibilities. Gaming Through History – any game setting. Do not sell history short. There are epic events, battles and mysteries throughout history that would make amazing RPG campaigns. Create adventures that are, in effect, parts of our unknown history. Hendrik Härterich shows you how with a wonderful set of guidelines, rules and ideas for using characters from just about any modern RPG to create settings and adventures from Earth’s past. Suitable for use with any Palladium RPG. Rifts® – The Kingdom of New Oslo™ by David Collins. Explore the European Northlands and face the would-be god of Hell Hounds and Fenry. A monster that calls itself Fenrik. Oslo overview, notable people and places, vehicles, gear, and adventure ideas. Heroes Unlimited™ – The Stage Magician, Revisited, by Matt Reed. An exciting look at a unique crime-fighter. Rifts® and any game setting – Different ways to run a campaign, by Julius Rosenstein. Game Master tips, suggestions and alternative rules. Rifts® short story about redemption and justice, by Mark Oberle. 96 pages of adventure and fun waiting for you.